When you walk inside Home Grown Cafe, the vibe is slick, well-planned, and mellow. I could bring my parents here for lunch and also enjoy a beer (even local beer like Dogfish Head and Yards!) with friends while listening to a band on a Saturday night. On this particular day I was with my husband. We sat outside to enjoy the gorgeous Spring sunshine. I’ve been here before, but I never really took the time to study the menu. Like I said, most dishes can be prepared vegan. Or if you prefer a steak, you can get that too. The menu has a lot to offer, from Crab Fondue (served with green apples and warm bread. Bomb.) to a Southwestern Burger (or Veggie Burger!). My husband ordered the Falafel. It is garlicky and fresh; I love the bean sprouts! 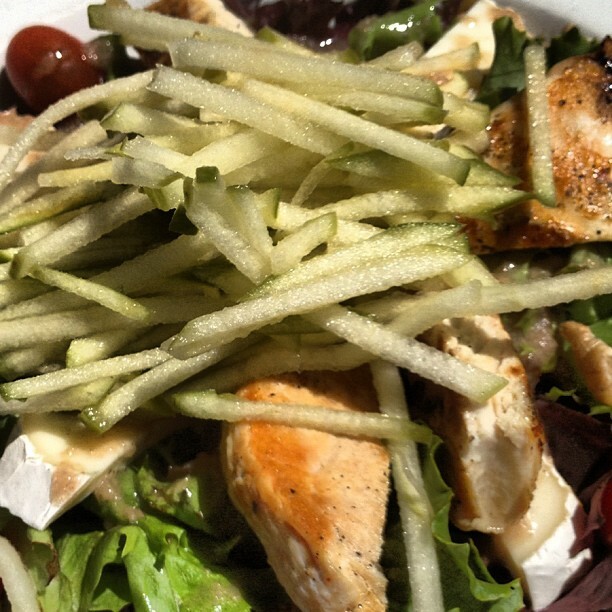 I ordered the green apple salad with grilled chicken. I could have ordered my salad with salmon, hangar steak, tofu, grilled shrimp, or a number of other proteins. The real star of this salad was the apple vinaigrette. Perfectly balanced and tangy. I talked to manager, Elizabeth, for the local scoop. Elizabeth says that the menu specials change based on the seasons and what’s available locally. During the growing season, the restaurant’s produce is sourced from Lancaster Farm Fresh Cooperative. Lucky for us, Home Grown is also a pick-up location for the Lancaster Farm Fresh CSA. Every Monday from May until October, if you are a member of the CSA, you can pick up your produce, fruit, or medicinal herbs, at the restaurant. Elizabeth says there’s a swap box available for members that want to trade something out (last year everyone traded dandilion greens. A lot of dandilion greens.). In addition to the local produce, Home Grown also sources mushrooms from the Kennett area and goat cheese from a local farm. Local farmer’s markets, like the Newark Farmer’s Market, are used whenever possible. A restaurant with a cool hipster vibe that cares about local food, local arts, and the local community? I’ll be back! Home Grown Cafe definitely has a local flavor all its own. 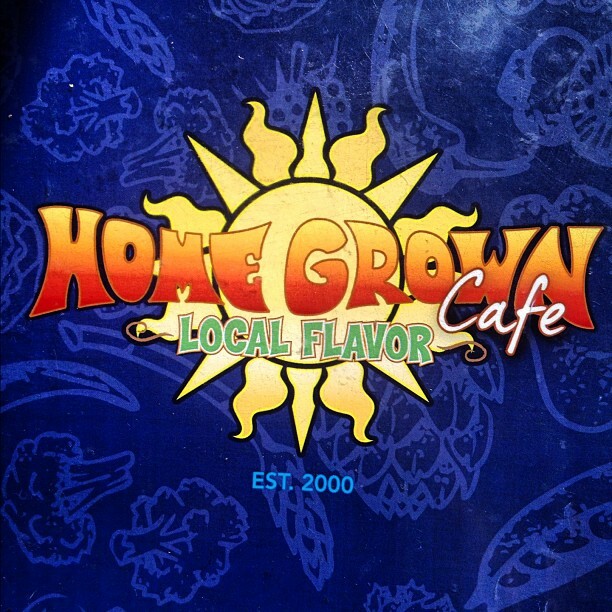 Home Grown Cafe's menu logo. Local flavor indeed. You intended for this blog to be about local sustainable foods, but it’s turned into a travel brochure. 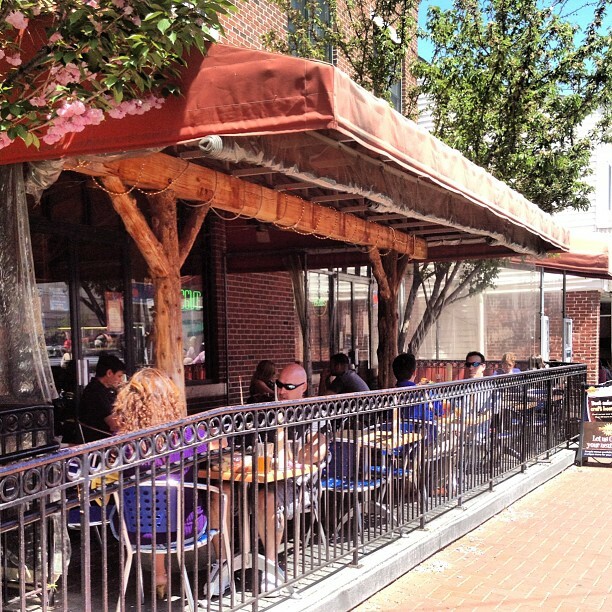 I want to go Delaware and eat at these awesome places! That looks like a great restaurant and of course, I love her food philosophy. Your husband’s falafel looks amazing as well. I hosted a bridal shower for my best friend here and it was fantastic! 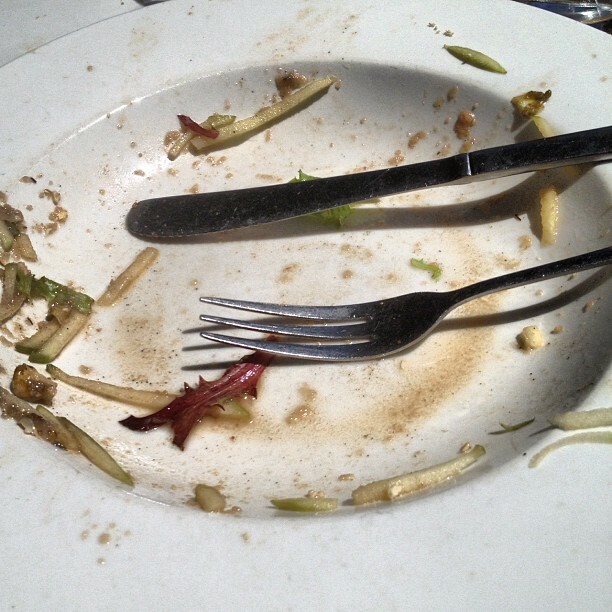 The food was so good and people could not stop talking about it. Glad you wrote about them 🙂 Oh, and the management there is super nice as well! Great post Rachel! 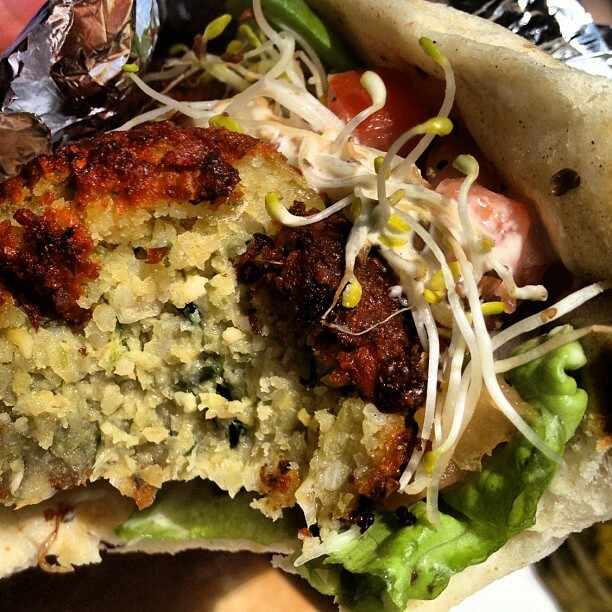 Vegan, vegetarian, omnivore, what have you – HomeGrown is hands-down my favorite place to eat. Recently celebrated my one-year “veganniversary” with their Black and White Tofu…which is equally good with chicken! Other favorites include the All-American sandwich, the aforementioned Green Apple Salad, and available-only-at-brunch Breakfast Quesadilla…all available vegan or regular and anything in between! Congrats on your Veganniversary! Well done!